Want to Connect laptop to your TV? Find out how to connect your laptop to TV based on what technologies are available on your laptop and television. 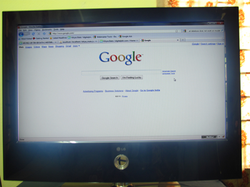 There are many options to connect your laptop to TV, choosing a connection depends on what laptop and Television you have. All the above methods are wired methods and now with new technologies like Intel WiDi (Intel Wireless Display) are available to connect your laptop to TV without wires (Wireless)! You can currently connect TVs with WiDi technology read more about connecting laptop to tv wireless. 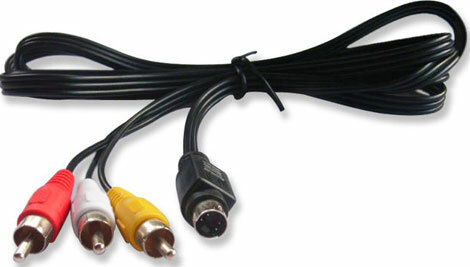 S-Video cables would be available cheap, just make sure you get the 4 pin or 7 pin cable to connect to the laptop , based on your laptop S-Video port. 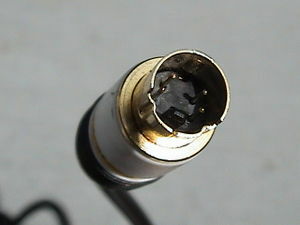 You will have to connect the audio output to audio input of the TV using a standard 3.5mm audio cable which is plugged into the headphone jack of the laptop and into the audio in jack of the Television. Read on to connecting audio. 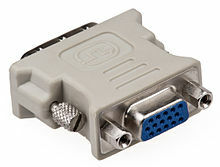 VGA port is one of the most common ports found in a laptop, and a VGA cable is used to connect your PC / laptop to your standard monitor. To connect it to a TV your TV should have a VGA port. Connect the VGA cable to both the ports and then read on to connecting audio. Except for HDMI, all other methods require you to connect the audio output of the laptop to audio input of the TV using a standard 3.5mm audio cable which is plugged into the headphone jack of the laptop and into the audio in jack of the Television. If you dont see your connected monitors / TV on your laptop screen as shown above, click on the detect button as highlighted. Now the television / monitor should be detected. There are 3 modes of displaying your laptop monitor on a TV. It is called Projection options since commonly laptops are connected to projectors. You can choose these by pressing (Windows + P ) key combination. 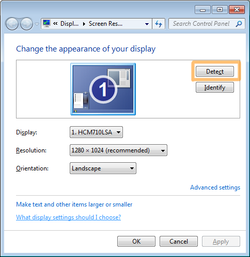 Duplicate Mode: In cloned mode or duplicate mode, a copy of your laptop screen is shown on the television. hi im having problem with the hdmi port.. my problem is that i can get it to work on my tv and have been streaming movies on it just fine but all of a sudden now it started glitching when im streaming a movie online or even watching it on dvd from my laptop can u help me.. i dont know why it started glitching on all the movies??? Can you check your hdmi cable? Can you try checking with a different cable ? i,am having a problem with android2.3 tv box.my tv is 18inch small flat tv.when i plug my hd 2.3 android tv box tomy flat screen tv it was working good,but when i change the picture resolution 760p with my hd android tv box then my flat tv became blank.so please help me if any body can. I've Compaq 620 laptop with HDMI port and a Samsun 29" CRT TV with component video and composite video inputs. I wanted to connect my laptop to the TV and so I bought a HDMI -> 3 RCA cable. I connected my laptop to to the tv through HDMI - Component connection and also through HDMI - Composite connection. But in neither case my laptop could recognise the TV. What is the problem? Having the same issue. Were you able to resolve the problem?